Above photo from [here] was taken at 119th and Western in Moore, Oklahoma. March 26, 2015 Reported in [Spirit Daily.com] from [here]. ‘God Is With Us’: Oklahoma Student Finds Unmistakable Symbol Dangling in Sky After Tornado Strikes. An Oklahoma high schooler said he found a divine symbol in the aftermath of a tornado that ripped through his neighborhood Wednesday evening. “Just found this after the tornado. God is with us,” Chase Rhodes, 14, wrote on Twitter. 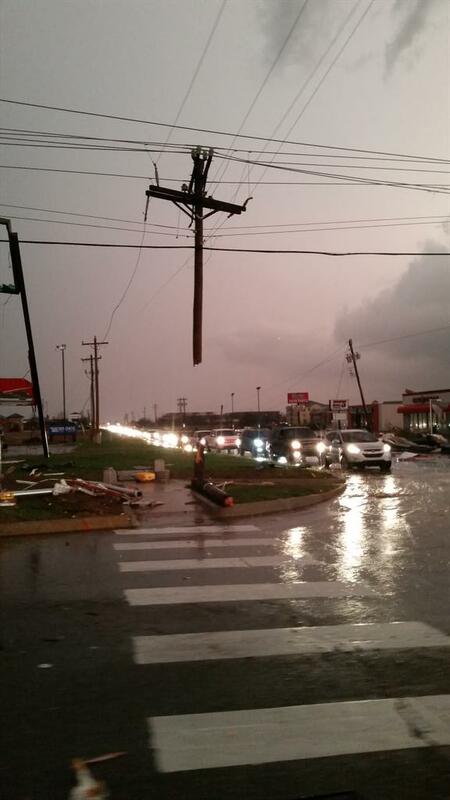 Attached was an image of a cross-shaped object dangling from a power line in the city of Moore. “It looked amazing,” Rhodes told TheBlaze. “I didn’t notice it at first, but it really did look like a cross over there. It was very cool.” The 14-year-old explained that he was with his family when the storm hit. “We were sitting in our house … watching our news and the power started flickering. They weren’t saying anything about a storm in Moore bit it suddenly popped over and started doing some damage.” “My mom was freaking out,” he added. “We got over to the shelter.” Rhodes said that his family decided to inspect some of the damage when they came across the object. An active church-goer, he told TheBlaze God immediately came to his mind when he saw the cross in the aftermath of the storm. Severe storms wrecked havoc across the state of Oklahoma Wednesday night, leaving at least one dead in Tulsa.